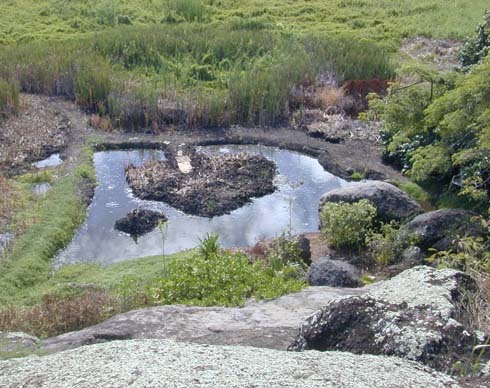 This page illustrates the progress made creating Pond C at Nā Pōhaku o Hauwahinee by clearing vegetation and digging out layers of peat beneath. Note that there are differences in scale and perspective between photographs. A low angle photograph is the earliest showing the start of Pond C (water at lower right). Pond B is behind, separated from Pond C by a finished access levee. Note small stand of bulrush in Pond B.
Photographed just after a storm: showing a higher than normal water level, but level not known. Most of the area is flooded mat and not deep pond. The surrounding access levees are completed and removal of peat and sediment is progressing towards the pond center. 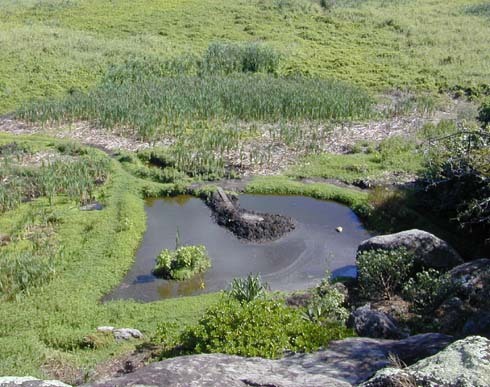 This approach enables us to dig by moving the edge of the mat back, create a deeper pond center, and establish shoreline vegetation early in the process. 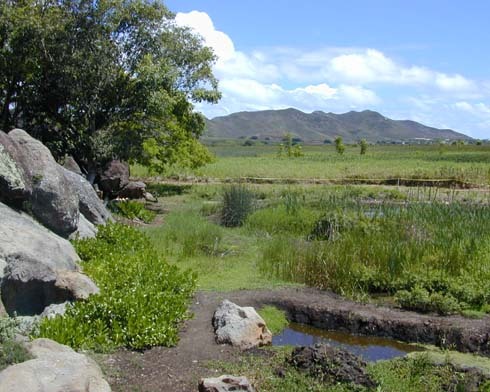 This recent photograph of the pond shows the substantial progress made since September 2002 (photograph at left). Note continued removal of material inward. Water level at this time was ~2.8 ft (corrected). 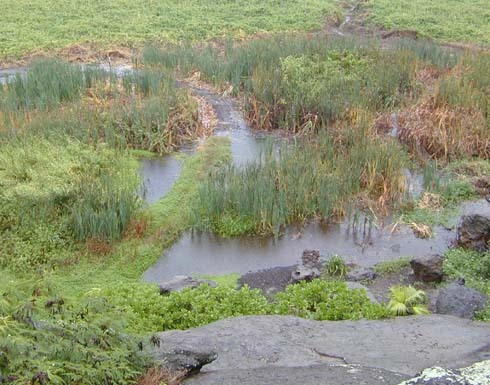 Cleared vegetation (mostly cattail) represents outline of Pond E (just getting underway).